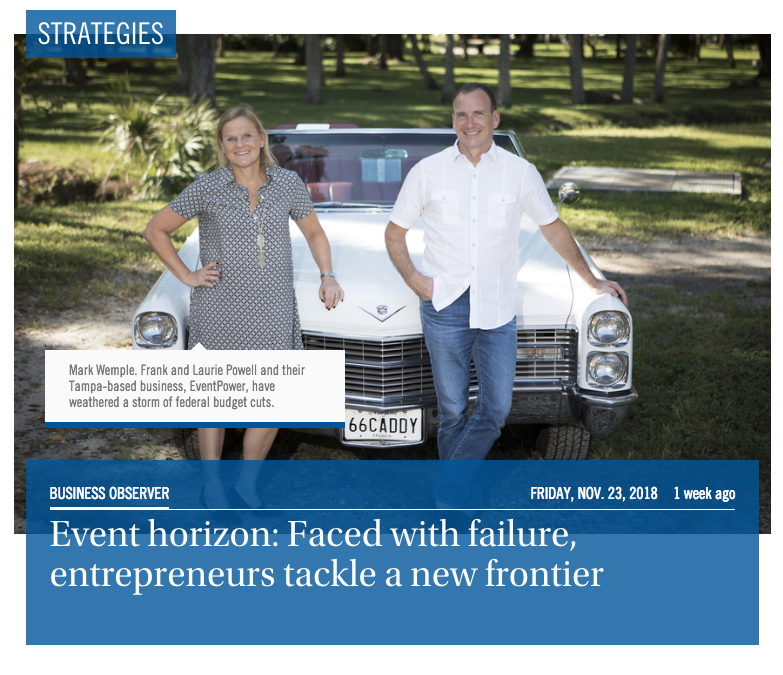 When an event management company’s main revenue stream dried up, it reinvented itself. The payoff has been celebratory. EventPower Inc. founder Frank Powell got his start in the event planning and management industry during his college days, when he helped produce concerts. Then he discovered the lucrative world of government event planning and began making big bucks. He produced as many as 30 conferences per year, primarily for groups associated with the U.S. military. The money flowed like a river — as much as $500,000-$600,000 per conference, he says. And his events attracted thousands of attendees, hundreds of exhibitors and high-profile speakers like Elon Musk, Al Gore, Michael Bloomberg and Presidents George W. Bush and Barack Obama. “The reason we’re still here today is because we had a knee-jerk reaction.” Laurie Powell, vice president of eventPower Inc.
Then the bottom fell out. The federal government’s hotly debated sequestration budget cuts earlier in the decade decimated Powell’s Tampa-based business, formerly known as Technology Forums. 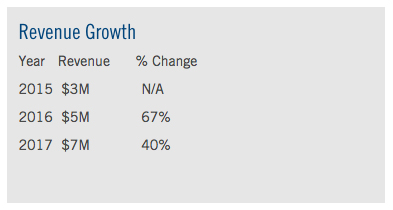 In a span of three months, Technology Forums went from more than $20 million in gross annual revenue to about $3-$4 million. The Powells had to lay off half their staff. That reaction — the snap decision to use eventPower’s internal, proprietary technology to branch out into the software-as-a-service business — proved prescient. It also drives home the lesson that even companies in niche industries need to be able and willing to diversify. During the company’s halcyon days, the Powells developed a software platform that could handle all aspects of event planning and management, such as speaker and agenda management; calls for presentations; attendee registration and tracking; lead retrieval and sales of sponsorships; and exhibitor space. They even branched out into website and mobile app development. But their bread-and-butter remained full-service management, from conception to on-site execution. Within a week of that conversation, the Powells changed the name of their company, to eventPower, and pivoted to offering software-as-a-service. They charge an annual flat fee, based on number of events, for most services. The Powells began to sell access to their suite of online tools under the eventPower banner. Slowly but surely, the concept gained traction. They went from about 15 clients three years ago to more than 60 today. EventPower, which has about 30 employees scattered nationwide and will be hiring three or four more in the coming months, still provides full-service event production. But diversification has paid off in the form of a rapidly expanding software-as-a-service business clientele. Revenue has rebounded accordingly, the Powells say, from $3 million in 2015 to $7 million last year, up 133%. They project 2018’s gross revenue to be in the neighborhood of $12 million. Laurie Powell, who was in business-to-business trade magazine publishing before coming to work full time for eventPower eight years ago, says the couple’s reversal of fortune can also be chalked up to their unique working relationship. 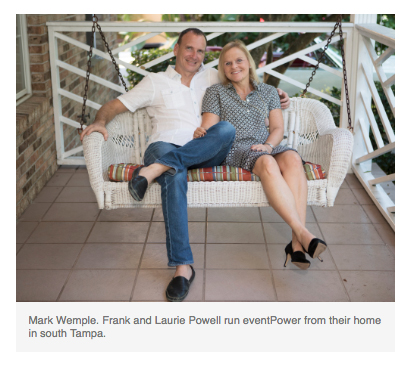 They run eventPower from their home in south Tampa while raising two children.